Tell us about the plot. What is SIN all about? Now you’re treading on dangerous ground. I don’t like to give away much. Sinclair (Sin) O’Malley left her home of Tumbleboat Key after high school and enlisted in the Marines. She was plucked directly out of Quantico by the FBI. Following a case where she refused to follow orders, she was relieved of duty. Six years later, the bureau wants her back. Six young girls and four of the bureau’s best agents have washed up on the shores of the Florida Keys. 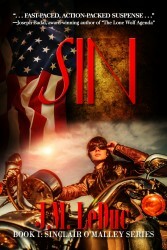 Sin goes back home with a chip on her shoulder for both the FBI and those she left behind to try to solve the impossible. The case takes her from the Keys to Nicaragua to our nation’s capital in a hunt for the killers. What she finds along the way is heinous, bone chilling, and all too real! One last question. Will we be seeing more of Sinclair O’Malley and what are your plans for the Brent Venturi and the Phantom Squad? You will definitely be seeing more of Sin. I’m in the process of writing the next book in the series, tentatively titled PAINTED BEAUTY. It will take place in Savannah, GA and Miami Beach, FL. It is slated to be released in the spring of 2015. I am also currently writing ideas for the next Phantom Squad novel. CORNERSTONE reintroduced us to some old friends and introduced us to some new ones: Tag and Wheels to be specific. I want to develop those characters in the next installment. I’m not going to give away any specifics (because I don’t know any at this point), but suffice to say, it will deal with secret codes, enemies within, and a Biblical twist. Thank you, J.M., for speaking with THE BIG THRILL. Mark Adduci, writing as J. M. LeDuc, is a native Bostonian, who transplanted to South Florida in 1985. He shares his love and life with his wife, Sherri and his daughter, Chelsea. Blessed to have had a mother who loved the written word, her passion was passed on to him. It is in her maiden name he writes. When he is not crafting the plot of his next thriller, his alter ego is busy working as a professor at The Academy of Nursing and Health Occupations, a nursing college in West Palm Beach, Florida. J.M. LeDuc’s first novel, CURSED BLESSING, won a Royal Palm Literary Award in 2008 as an unpublished manuscript in the thriller category and was published in 2010. The rest of the Trilogy of the Chosen: CURSED PRESENCE and CURSED DAYS followed in 2012, as well as a novella, Phantom Squad—a prequel to the trilogy. CORNERSTONE, the continuation of the Phantom Squad Series was published in 2013 to critical acclaim.